It's been 29 years to the day since EP officially left the building. 29 years! 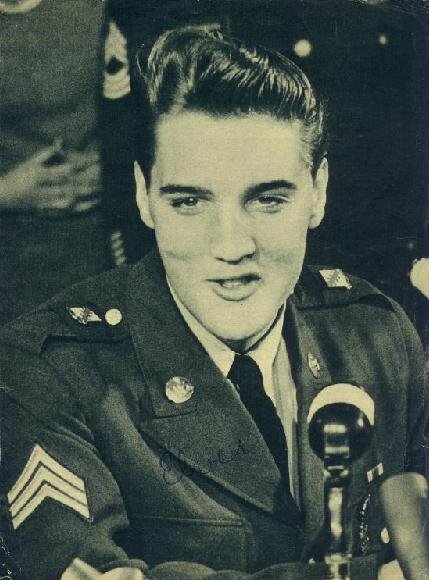 29 years and a day ago, Elvis Presley was something of a joke, fat, sequined, a relic. Relegated to the Oldies station. A distant memory in a year when you could've gone to see the Ramones, the Clash, the Talking Heads, or Iggy Pop perform live. His last hits -- in a statistical sense -- had been In the Ghetto and Suspicious Minds. See what I mean? A joke. Dying was the best career move he could've made. Since then, he's been deified. Put on postage stamps. Commemorated and celebrated. Elvis Could Still Be Alive if He Drank This. But Elvis was a teetotaler, so maybe that's inappropriate. Perhaps we should focus on something that's more in line with his habits. 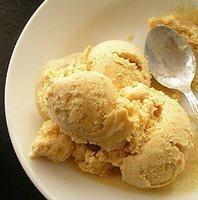 Me, I tend to go for a replication of Elvis's last meal: a whopping big bowl of Peach Sealtest ice cream (4 scoops! ), garnished with a dusting of codeine, morphine, Quaalude, Valium, Placidyl, Sinutab, and Nembutal (go light on the Nembutal -- the bitterness completely overwhelms the delicate peach flavor; I've also left out a few pharmaceutical elements, either for reasons of aesthetics or availability). Grind up the pills, open the capsules, and sprinkle the powder on top or mix it in, ala Ben and Jerry. I eat this creation sitting in bed, watching TV, just like Elvis did that fateful night in 1977. It's not so hard to sing if you wait about 30 minutes after you eat your ice cream treat. Makes it much easier. Almost painless. Honestly! For those of you who are members of the Factinista, you might want to get a prescription filled at the Prescription House, Elvis's favorite pharmacy. Just for old times' sake. That's at 1800 Union Avenue, Memphis. 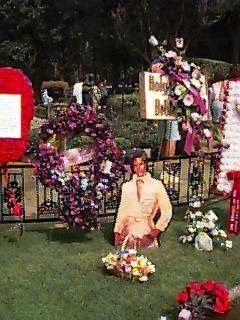 But the best thing of all is to finally make that pilgrimage to Graceland. That's the truly apt tribute for the faithful. You might -- if you have the balls, as Stephen Colbert might say -- try to gain illicit access to the actual Death Bathroom (or DB, as it is referred to by the cognoscente). Our past experience shows that it's not easy, but I'm certain it'd be rewarding. In fact, some years ago, before our first trip to Graceland, Marcia got up the gumption to quiz the Graceland management whether it was possible to take a quick peek at the DB. "No," they told her. "No-one's allowed up there except the family." 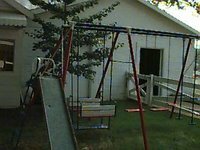 So instead, on our first pilgrimage to Graceland, we wandered around and gawked at Lisa Marie's swingset and all of the other authorized artifacts that remind you of why it's best not to view a celebrity from too close-up. Graceland, 10pm. Elvis Presley Boulevard is closed to through traffic. We park on a nearby street. Black kids are hanging tough on neighboring lawns. 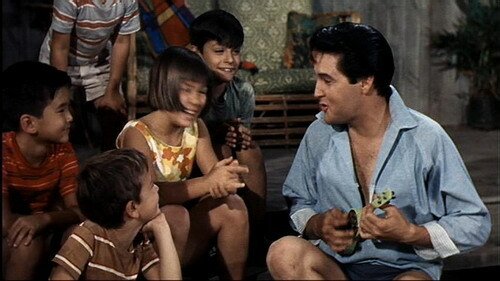 “Elvis is DEAD!” they shout and laugh. They’ve been entertained by a steady stream of overweight overwrought white people who’ve been passing by all evening. It's raining. Someone has been selling disposable orange rain ponchos to the milling throngs. A surfeit of orange transforms the crowd into Moonies. A three hour line snakes up and down EP Boulevard for those who wish to file past the grave site. Every lost soul in Memphis is standing in this line, clad in orange ponchos or white jumpsuits, carrying candles and other tokens of their esteem. A heavy-set black woman sits in a lawn chair on the median strip. She looks like Elvis’s nighttime cook, Pauline, who was on duty that fateful night 25 years ago. We wander amidst the serpentine lines of Elvis fans. Like us, they are each in a private daze. The Graceland shopping complex is open and promises to stay so all night long. Opportunists mix freely amid the Lost. There's a line-up of wheelchairs as if Graceland were a Southern Lourdes. Everyone seems to be getting older and fatter as the night wears on. Flesh overhangs the sides of wheelchairs. Pallid faces glow in the candlelight. I'm sure there'll be something similar, although less grand in scale, tonight if you want to attend the celebration and make your own way to the Death Bathroom. There's still time to rev up the Lear Jet and zip out to Memphis! Finally, if you can't bear to leave your chair, you can do what I did this year: do Elvis commemorative searches. The thing is, you don't want to search for Elvis yourself; that'd be so ordinary. What you want to do is watch other people searching for Elvis. After all, isn't the most famous picture of Elvis the one where he's getting his Junior DEA badge from our own beloved Mr. Nixon? I'm sure Elvis himself would approve of such a well-meaning privacy violation. The best way to do commemorative searches is to use that AOL data that was cut loose a few weeks ago. Oh, look! AOL user number 279449 not only searched for Elvis ("Elvis has not only left the building he is dead"), but also for "banana pudding with cool whip and sour cream" and "younger man older woman." She clearly knew what Elvis was all about. Although I'm sorry to hear about those "tiny bumps after tanning bed use" and "signs of depression." Not to mention the "can't get an erection" and "how to firm up saggy legs." You can learn more about Elvis's fans than you can about the King himself. Mistah Elvis -- he dead. Rumor has it that Joseph Conrad was a huge Elvis fan.